1. What are your current energy needs? Refer to your utility bill to gather information on your current energy consumption. Make sure you gather consumption data for a complete full year – preferably for a whole period of 12 months in order to capture your consumption pattern in all four seasons of the year. From your utility bills, establish your energy consumption in kilowatt-hours (kwh) for each month and make it a habit to keep a clean sheet record for future reference. Revisiting this record can help you gain a better understanding of your energy consumption and help you develop a culture towards energy-saving. Your average monthly energy consumption can be calculated from your recorded utility bills as explained above – it is important that you use a total sum for 12 months and then divide it by 12 to get a representative average figure (i.e. the total energy consumption of a year (in Kwh) divided by 12). While estimating your average monthly energy consumption, you may find it useful taking a note of maximum and minimum consumption fluctuation during the year ; this way you become aware on how you consume energy and how to save it. 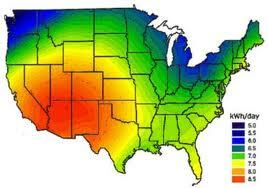 Refer to solar radiation maps for your home area to establish the potential of solar energy at your location. This information can be found as Mean Solar Radiation from relevant Meteorological Agencies. Typically this is expressed in hours of sunlight over a period of thirty (30) days – e.g. 180 solar hours / 30 days). As a general guide, the size of your solar panels (wattage) can be found by dividing your average monthly energy consumption (Kw-hrs) by the monthly average sunlight hours for your home area (hrs). i.e. For an average monthly consumption of 360 Kwh and an average monthly solar radiation of approximately 120 hours, you will need a system of approximately 3.0 Kw (360 kwh/120 h). It should be noted, however, that this figure is based on average numbers; consequently, a 3kw solar system will not be adequate to cover for your maximum energy demands if you are planning to have your total needs covered from solar energy. To compensate for this ‘energy gap’ you should either consider installing a larger size system of incorporating appropriate energy storage. 6. How many solar (PV) panels do you need? After having gathered required information on your solar energy system, solar energy needs solar energy potential at your location and estimating a size for solar panels (wattage), you can then start looking and comparing different solar panel products; there are many solar panel companies / installers offering solutions for solar photovoltaic (PV) panels and is up to you to gather useful information that will help you make a sound decision. 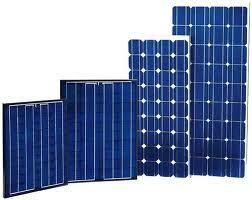 You may be interested to ask for the size of solar panels, efficiency they offer, whether they have any certification or rating, an estimate on installation costs and other related costs – for installing the solar panels system you will need an inverter perhaps some batteries storage etc, and an estimate of the product life-duration and minimum product guarantee. You should be able to assess your home solar panels investment by considering the payback period and an estimated guaranteed product life cycle for depreciating your investment. In general, while comparing solar panels make sure you use comparable data; e.g. if you are planning to install a home solar photovoltaic (PC) system of 2.5kw installed capacity you will need 25 solar panels of 100 watt – similarly you will need 50 panels of 50 watt. After you have estimated a size of your solar panels it is always a good idea to double check your figures by using a solar calculator or solar estimator tool, which can be easily found at solar energy agencies or from energy installers.